Over the years I have collected many hundreds of unpublished tarot designs direct from the artists or from some graphic sites. Some of these are truly amazing. So I have decided to set up this page on which I will occasionally post images from some of these tarots. Click here to join the Art Tarots emailing list. Click here to see the Tarots Collectors Forum. Jorge Lewis of Bogota in Colombia contributed some designs to a collaborative tarot project. He seems to work initially in pencil, then scans his drawings and colours and textures them using a digital graphics program. They are numbered unconventionally. There are a number of designs for abstract tarots and even a few published ones. I actually published a fine example of this in the Rotin Tarot. The drawings of Voicu Dragomir of Bucharest, Romania, neatly encapulate the tarot ideas without having to use figurative elements. 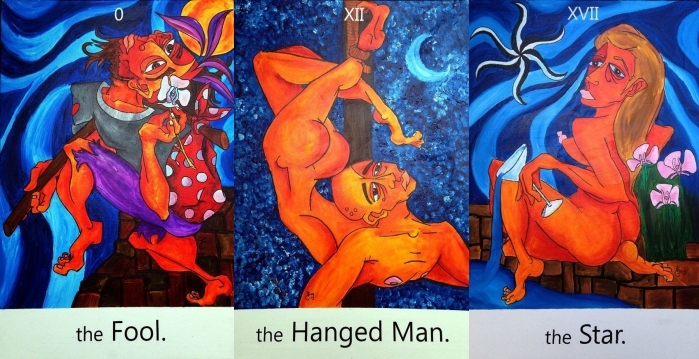 Here are his Lovers, Hanged Man and Death cards designs. Tiago Pimentel is an artist working in Lisbon, Portugal. 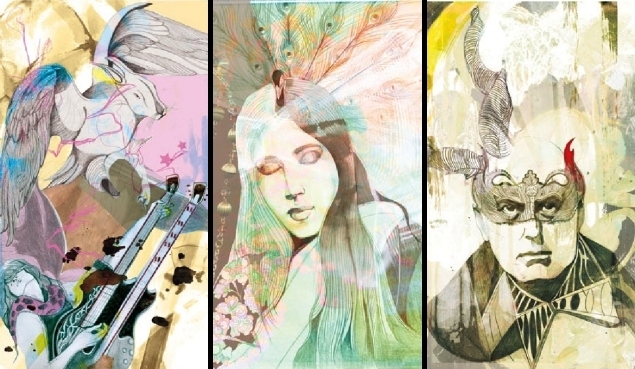 He has created some paintings but he seems especially drawn to photo-manipulation and collage, and he has used this medium to create a set of designs for the Major Arcana. His artwork is very strong often with a sharp satirical edge, but his tarot designs are more restrained and reflect the tarot archetypes, though his need to make some political statment is never far away, thus his Fool as a soldier and Magician as a Nazi. The Morrowind Tarot is a fan art tarot for one of the Elder Scrolls computer games. Morrowind is the third in the series and is available on a number of platforms. 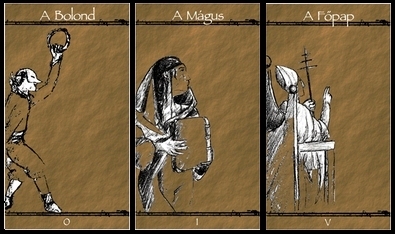 I found this complete set of digitally created designs for the Major Arcana by Alvirdimus on Deviantart. I do not know the details of the game but I assume the card designs are based on the various characters in the game. 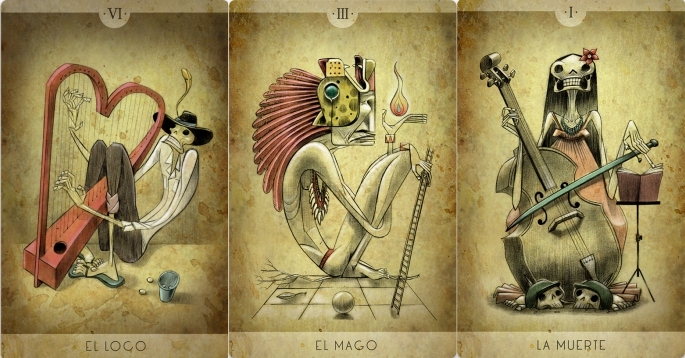 Mexican graphic designer Miguel Cruz created some tarot images as the cover art for a rock band called The Fool. He used the impossible triangles first devised back in the 1960's by British mathematician Roger Penrose, and later popularise by graphic artist M.E. Escher. Miguel Cruz reworks this rather well into a tarot context. From the cacophany and decibels of heavy metal to plastic building bricks - such is the range of tarot art. 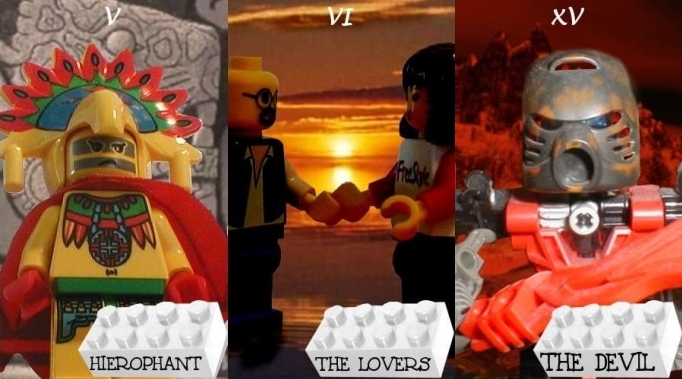 So someone has created a Lego Tarot. No that is incorrect - there are at least three Lego tarots! The Led Zeppelin Tarot images were created by Felicia Atanasiu, a Romanian artist and graphic designer now living in Toronto. I am afraid that my musical interests are closer to Delius and string quartets than heavy metal, so cannot read the references in the imagery, but even I am able to recognise Jimmy Page's double-necked Gibson in the Magician card and his magical mentor Aleister Crowley taking his place as the Devil. Most other associations, probably to song lyrics of biographical details of band members, are totally outside my sphere of expertise. Here are the Magician, the Priestess and the Devil designs. Autumn-Sakura is a Russian artist on Deviantart. She has very strong drawing skills and often works in Western comic book and Eastern Anime styles. 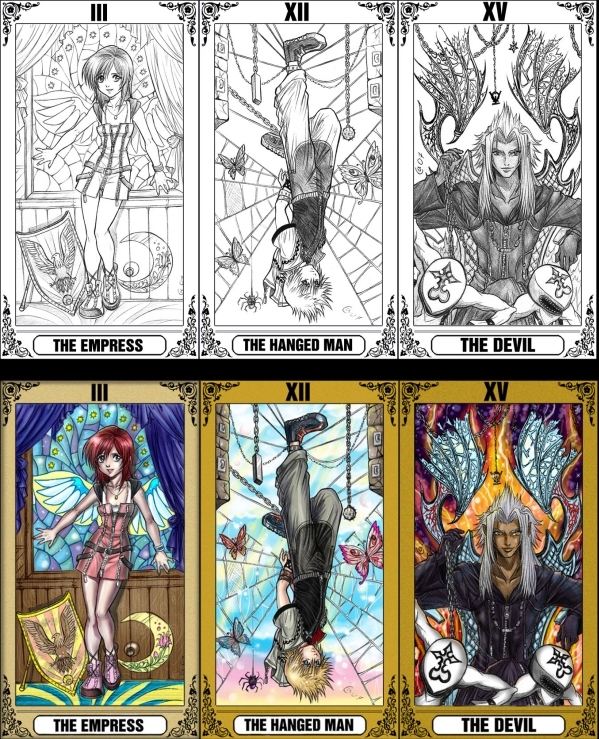 She showed her original pencil and pen drawings for her Kingdom Hearts Tarot and has now begun colouring them. Kingdom Hearts is a role playing game developed jointly by Square Enix and Disney Interactive Studios, issued on both Playstation and Nintendo. Here I show her original pen line drawings and her coloured versions. 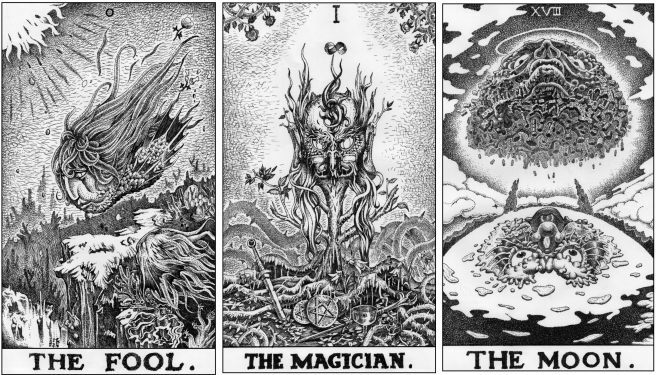 Jesse Peper created a second set of tarot images, clearly based on the earlier pen drawn version, though here he adopted an almost square format. These were created using watercolour and possibly brushed ink. Jesse Peper often works on scraperboard and coloured pen drawings. 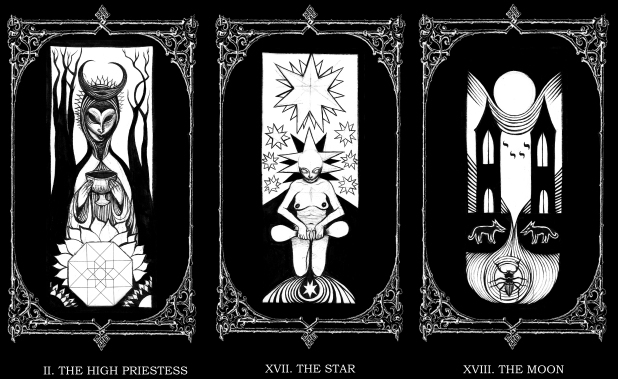 For this set of tarot designs he used pen and brushed ink, adopting an elongated format. Sadly I have no information about this item except that it is a Hungarian tarot obviously designed for children. This H.P. Lovecraft Tarot can be found on Deviantart. It was created by US based Eric York whose pen drawings are beautifully sharp and crisp, with some use of dottted shading. Readers familiar with the Chthulu mythos will be able to follow the references in these drawings. Gonzalo Eyzaguirre from Spain created these collaged images as promotional material for the music group La Iglesia de Abigail which seems to be a Chilean version of Marilyn Manson, their music being in dark goth industrial style. Danielle Bissell from Pennsylvania created her Golden Dawn Tarot as her senior thesis project. Her pen drawings are very fine and wonderfully complemented by the use of watercolour washes for the backgrounds. Her designs are original and based on the elemental, planetary and astrological attributions rather than following the well known Golden Dawn emblems. Graphic artist Georgina Cseto from Budapest in Hungary, works primarily using computer graphics, though her starting point for designs is usually freehand drawings and paintings. 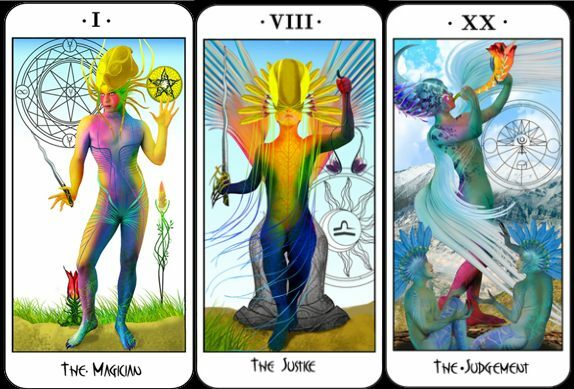 She has worked on many projects but thankfully created this interesting set of tarot Majors. 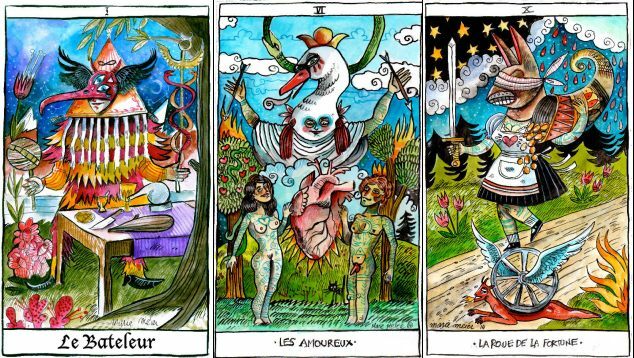 Colombian-American painter estudiomau has created his Tarotmau using acrylic on large canvases. He sells prints of these on his website www.estudiomau.com but does not appear yet to have issued these as an actual deck. The colours are vibrant and he obviously enjoys the interactions of the complementary colours, orange and blue. 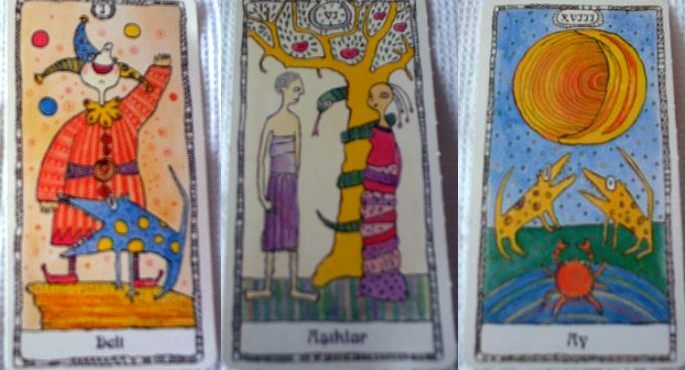 Juan Rincon of Caracas, Venezuela, has created a set of tarot designs in which the human figures become metamorphosed into tree forms. Thus the Magician's hair has become the branches of trees, while a woodpecker stabs at his ear. The nose of The Hierophant is becoming transformed into a tree trunk. In Juan Rincon's tarot universe Death is depicted as human figures becoming entirely interwoven with tree branches. A quite unusual though striking and neat idea, very well realised. The Alas Vegas Tarot by John Coulthart celebrates and gently pokes fun at 'Sin City' Las Vegas. 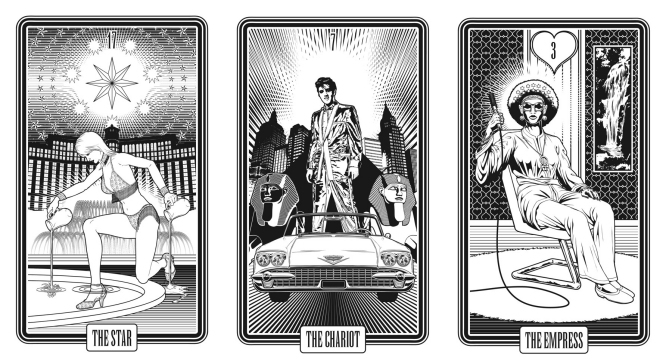 Using a graphic drawing program he created images reflecting the life of Las Vegas while retaining the tarot imagery. Thus the Star shows the fountains at the Bellagio hotel/casino, the Chariot incorporates Elvis Presley, one of the obsessions of the Las Vegas culture, while the Empress depicts a cabaret singer. I first came across this tarot by Jero on Deviantart some years ago. 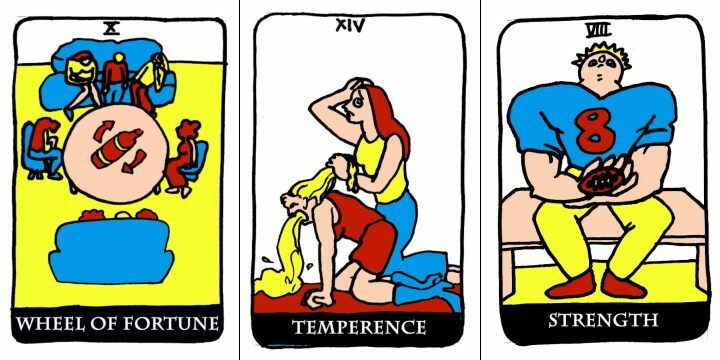 It is deliciously irreverent and also in places quite gruesome being far removed from the craft and subtleties of fine art or deep esoteric symbolism, but nonetheless represents an important facet of tarot art. Etching is a hard medium to master. Creating and printing an etching is labour intensive and also the nature of the process means that the plates quickly become eroded during printing so that large editions are impossible. Etched tarots are among the most expensive, usually fetching at least a thousand dollars and often more. 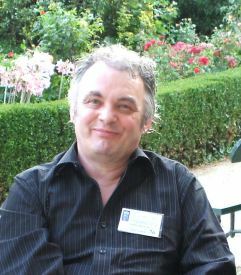 Michal Brodka, though born in Poland, currently resides in the USA and has developed the skill to create fine etchings. Alongside his technical abilities he has an ability to find original ways to depict tarot imagery. The perspective of the Hanged Man is quite amazing. His Hermit is an Indian fakir sitting in a carved niche and holding fire in his hand. Heather Evenenstar Allen's remarkable tarot designs exhibit swirling elemental energies which arise out of and envelop the forms. The colours are so intense being realised in a series of oil paintings. 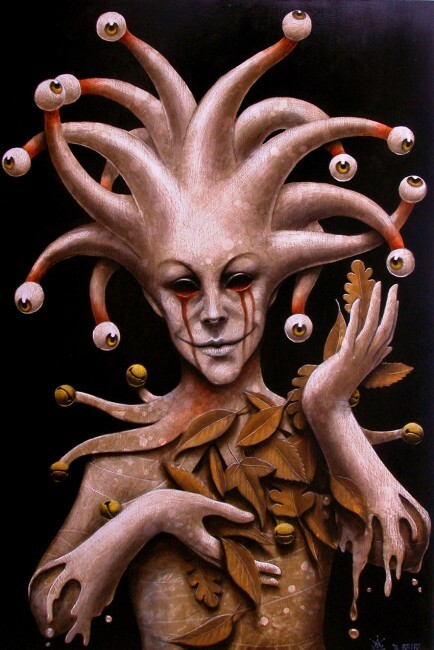 Sadly, she seems uncontactable otherwise I would have offered to publish this in my Art Tarot series. There are so many wonderful tarot designs out there, this is among the best. Hannah Chusid describes herself as a "NYC Illustrator, Writer, Comedienne, and Tour Guide. Creator of zombie drag queens and dysfunctional masterpieces". She certainly has a strong and intense drawing style which she uses to great effect in her tarot designs. US graphic artist Grace Kwon is a master of many genres, but she clearly showed her skills in creating tarot designs in the art nouveau style. In 2006 I was lucky to have been able to publish Peter Rotin's tarot. Peter's designs were highly abstracted forms that still reflected the tarot ideas and were immediately recognisable. Giuseppe Gallucci's designs have a similar degree of abstraction though using the medium of painting. Italian graphic designer Giulia Cinarelli has made a rather fine set of tarot designs using the difficult medium of linocut. 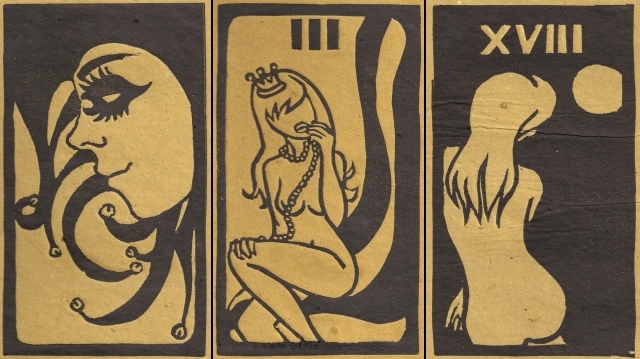 There are only a few artists who have used linocut for tarot - Jean Bertholle in 1949 and Carol Hartmann Devall's Cirque de Whimsy Tarot of 2008 being the only ones which have immediately come to my mind. Giulia Cinarelli uses the natural qualities of linocut, rejecting fussy details to exploit the medium's ability to present large printed areas and clean flowing lines. Gian Paolo Dulbecco is a major Italian painter (though sadly not much known internationally). 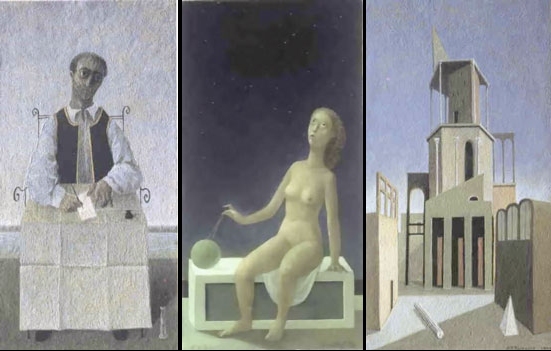 His style, which has been described as metaphysical and Magical Realist often uses the pictorial language of De Chirico, Paul Delvaux and Magritte. Back in 1983, early in his output, he worked on a series of tarot paintings in oils. I assume they were the subject for an exhibition. 1993 saw his participation in the group exhibition "Art & Tabac" under the artistic direction of the French critic Pierre Restany, in which he included a series of paintings on the theme of tarot but with the imagery of tobacco smoking. I have discovered that the Galleria Francocancelliere in Messina (3-27 December 2004), mounted an exhibition of Dulbecco entitled Arcani maggiori. I am not sure if this was new work or some of his earlier tarot designs. 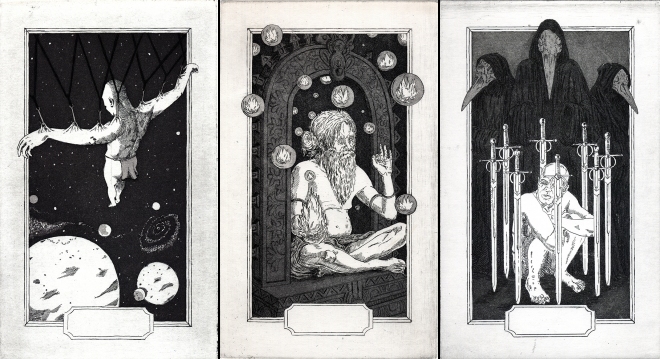 Anyway here are some of his 1983 tarot designs. In his artwork he creates a quiet contemplative space for his images. They do not reach out and shock, but gently and subtly present their message. Here are his Fool, Star and Tower. The Futarot by Eramos Tantos from Mexico celebrates the world of international football. 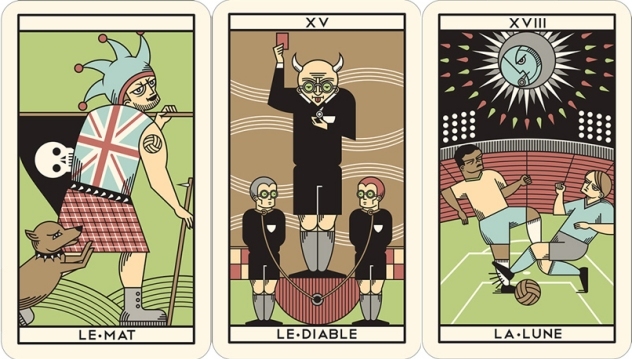 Its witty imagery includes recognisible depictions of Leo Messi, Diego Maradona, Pele and David Beckham, all in appropriate guises in the tarot context. The Fool caricatures English and Scottish football fans. Tarots created using the medium of scraperboard are rare indeed. The best known are probably the Polish Tarot Sweitlistej Drogi and the Revelation Tarot from Australia. This tarot by Emma Ylinen-Ceau based in Finland is a fine example of what can be achieved in this medium. She has subtly applied a sepia or burnt Sienna tone to the images which gives the imagery a depth. 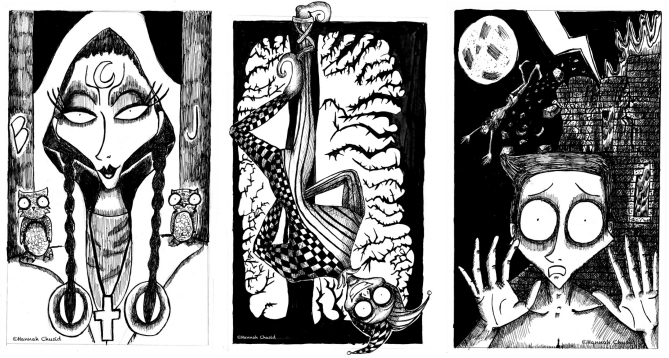 She has also produced some pen drawn tarot designs based on portraits of her friends. The Korean artist Yun Heeseoung has created a tarot using some rather engaging pen drawings often using flowing organic forms. The image for the Moon card is particularly striking. 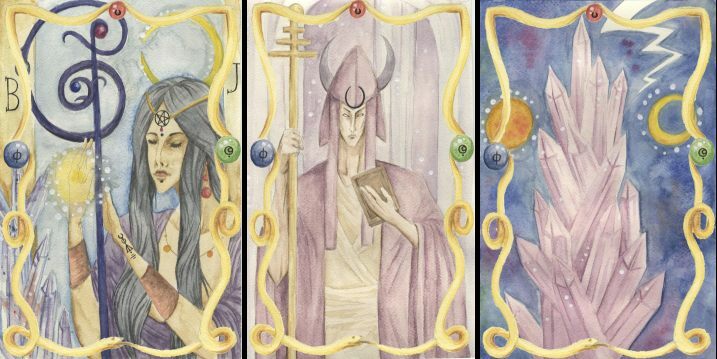 The Crystal Moon Tarot has rather delightful watercolour paintings by UK artist Natalie Bishop. 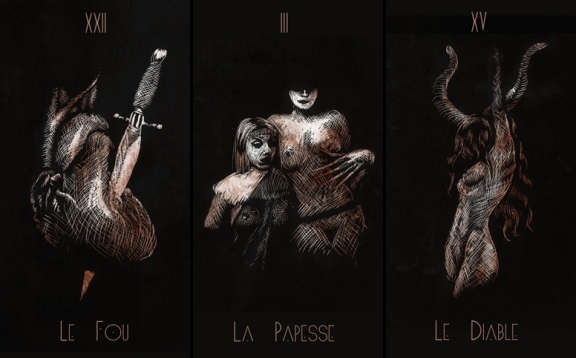 I found these on Deviantart a year ago and tried to contact her as I thought these might be publishable in my Art Tarot series, but she does not seem to be active on that site any more. The Tower is rather neat as it is depicted as a pile of crystals. The College Tarot by Elizabeth Beier presents a satirical and a rather bleak view of American student life. 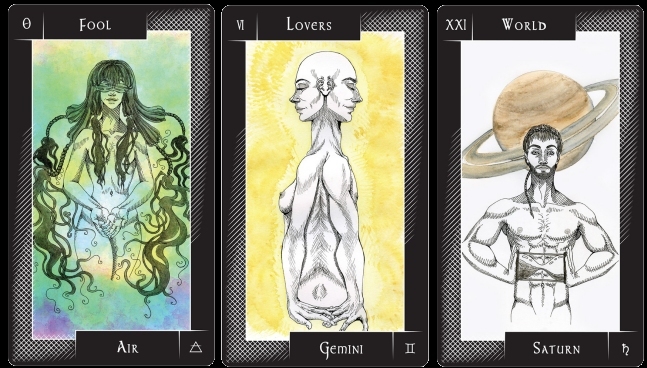 The women in Cristy C. Road's tarot designs certainly have attitude. 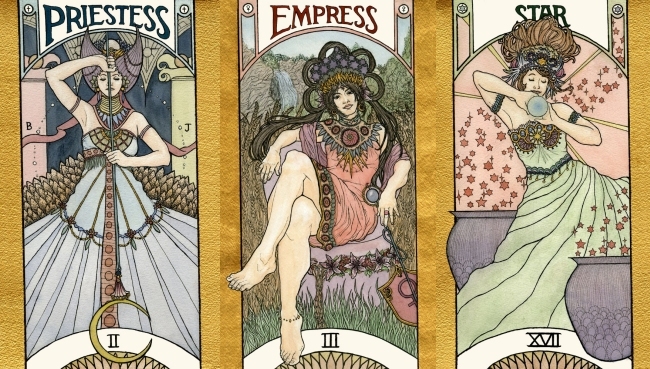 Here are her High Priestess, Death card and the Queen of Swords. The Faunos Mystic Tarot is by Wladimir Cossio. The graphic device of using a continuous gradient rainbow effect on the figures is rather engaging. 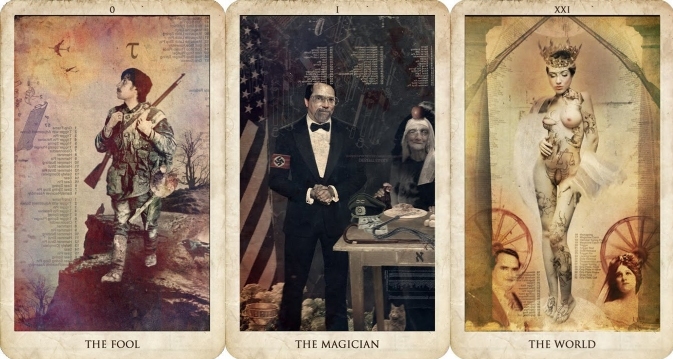 The Mascarade Tarot is a set of posed photographs digitally modified and collaged created by Camille Miranda. 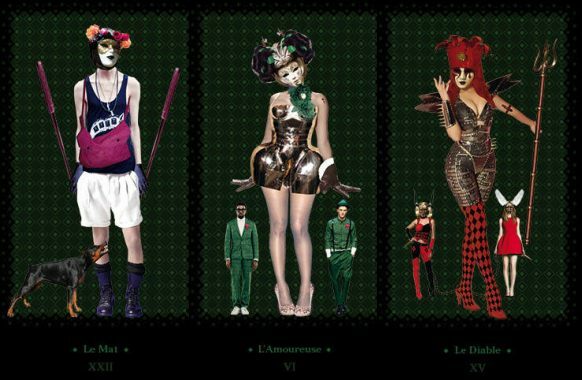 All the models wear Venetian style masks. The Goddess Artemis Tarot was created by a Turkish woman. I did consider this for my Art Tarot series, but sadly, was unable to negotiate with the artist. Her website/blog has meantime disappeared so I may be one of the few people with copies of some of the images. She did not have a scanner so these images were made by photographing the cards on a table, and these are a little out of focus. The Wilder Mann Tarot was created by Marie Meier. Some rather fine creative drawings delightfully coloured. Here is one that will interest UK viewers of this page. I have just discovered a set of tongue-in-cheek 'Tarot' promotional cards for the Electoral Reform Society stand at Conservative Party Conference in 2009 to encourage party candidates to book individual briefing sessions run by their Director of Research. A full set of 23 designs were produced, but only five designs were printed. The cards were a big hit and were also featured (uncredited) on the front page of the Times. A few years ago I found these satirical tarot designs on Deviantart. They were created by V.A. Abraxa in pen and watercolour. They are relatively benign compared with some of the artist's comic stips. 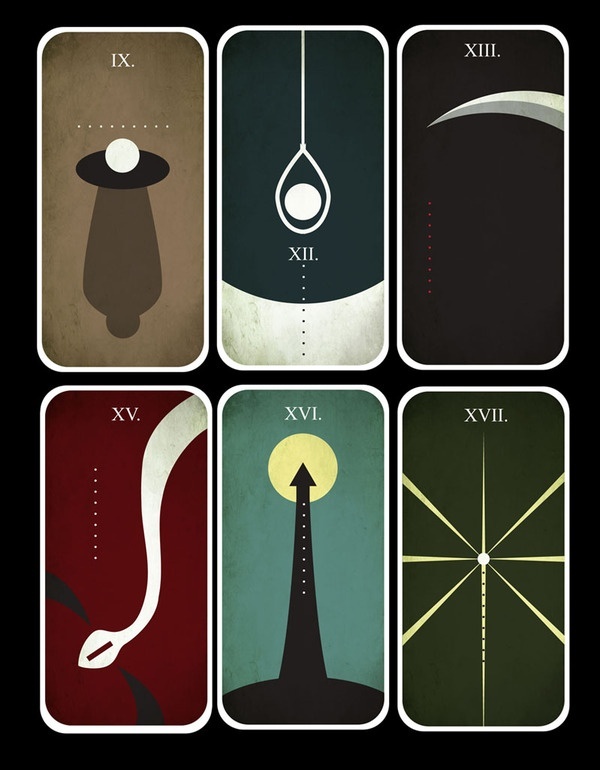 I first came across the tarot designs of Matteo Arfanotti about ten years ago. I was so impressed by these painted images which are made to appear as if they are carved out in relief from some hard polished stone. I did approach him to see if it might be possible for me to publish his designs in my Art Tarot series, but nothing came of this. When was preparing the images for this page I checked his name again on the internet and discovered that in 2010 he had returned to the tarot and created at least the image for the Fool. Oil or acrylic paintings by a Japanese artist under the name Kage-Yu. Sadly, the website has now disappeared. It is this fugitive aspect of the internet, where a user's subscription to a ISP or a file sharing site lapses, and their work disappears from view, that has made me determined to record these designs. I have a database currently holding some 500 unpublished items but there are many times that out there unrecorded. From left to right Fool - Magician - World. This pen drawn tarot by Jaen approaches the imagery from a surreal perspective. From left to right Magician - High Priestess - Hierophant. Go to Archive 1 - entries from 21st November 2006 to 30th April 2007. Go to Archive 2 - entries from 1st May 2007 to 1st November 2007. Go to Archive 3 - entries from 2nd November 2007 to 30th November 2008. Go to Archive 4 - entries from 12th December 2008 to 29th June 2010.